The Chimp Store won’t be stocking Adidas Originals’ Spring/Summer 2014 collection till January, but that isn’t stopping the Leeds, England-based boutique from giving its customers an exclusive sneak peek with some unconventional stand-ins. The store tapped British artist Chris Anderson to recreate to-scale versions of the upcoming styles using 100 percent recycled cardboard. Anderson spared no detail. His ersatz “Stan Smith”, “Campus,” “Superstar Shelltoe,” “ZX700,” and “ZX8000” sneakers feature Adidas’s trademark parallel bars and perforations, logos whittled from masking tape, and even matching shoelaces cleverly fashioned form jute twine. The Chimp Store won't be stocking Adidas Originals' Spring/Summer 2014 collection till January, but that isn't stopping the Leeds, England-based boutique from giving its customers an exclusive sneak peek with some unconventional stand-ins. The store tapped British artist Chris Anderson to recreate to-scale versions of the upcoming styles using 100 percent recycled cardboard. Anderson spared no detail. 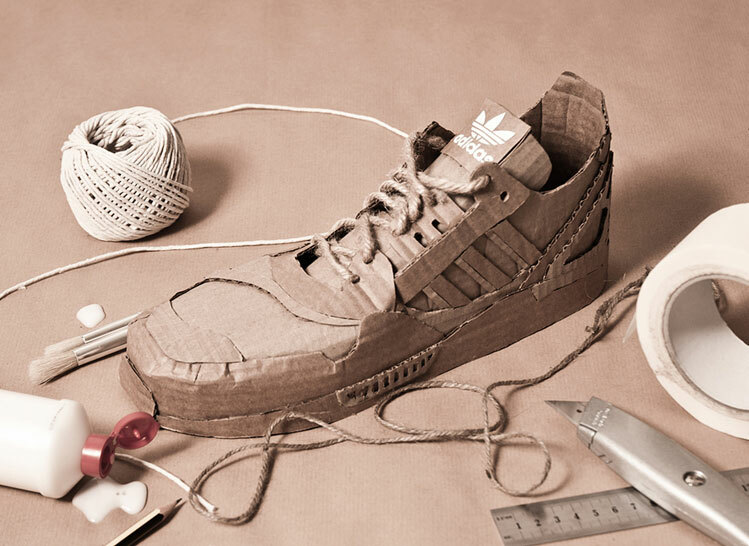 His ersatz "Stan Smith", "Campus," "Superstar Shelltoe," "ZX700," and "ZX8000" sneakers feature Adidas's trademark parallel bars and perforations, logos whittled from masking tape, and even matching shoelaces cleverly fashioned form jute twine.